Fabricating buildings out of steel is an established process and yet it requires a knowledgeable crew, the right equipment and appropriate protections to accomplish it properly and safely. The frames for steel buildings are commonly pre-engineered and the construction company forms the beams in advance. The frames are then erected at the building site and finished. It's the variety of applications and detailed specifications that keep the contractor on his toes. Steel buildings are usually not intended to have standout architectural features, although technology has now reached the point where they can be rendered aesthetically pleasing if so desired. Emphasis is clearly more on function than on form. 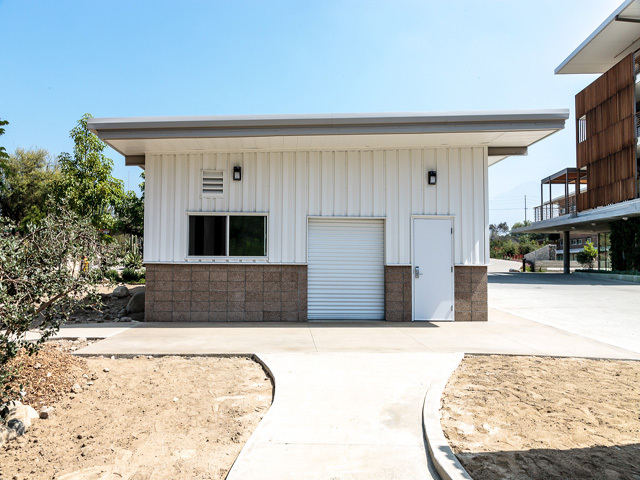 The primary motives for using metal buildings are to reduce labor and materials costs, to construct them more quickly, to use relatively few components and to obtain a low-maintenance, durable and weather-resistant product. Traditionally, steel frames have been engineered employing basic two-dimensional analysis. The I-beams are dimensioned according to cross-sectional calculations and then fabricated through the welding together of steel plates. In the field, erectors bolt the I-beams together into one unified structure. Recent technological advances have enabled engineers to use three-dimensional analysis, providing better structural integrity in all directions. Design variations include castellated beams, mill sections and trusses. There are applications for steel buildings in all industries. 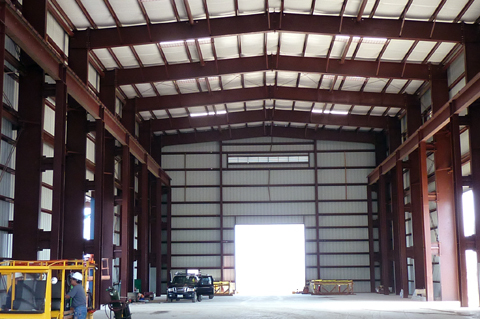 In the aviation and aerospace field, large hangars are universally constructed out of steel. Hangars invariably require high ceilings, high eaves and big clear spans to accommodate aircraft, all of which contribute considerable complexity to the design. Hangar layout and choice of doors are additionally important design considerations. Many aviation designs carry over into the construction of sports arenas and recreational buildings. Commercial and industrial companies utilize metal buildings for a host of applications, such as warehouses, maintenance shops, vehicle storage and administrative space. Oftentimes these structures call for more care in the design of cladding and exterior appearance than in other applications. Also, each industrial process and flow tends to have unique characteristics and requirements. Architects and contractors must fully understand these and plan the construction to accommodate them. It is not unusual for all buildings in manufacturing construction to be made of steel. Warehouses and warehouse-like structures are commonplace. In these applications, the contractor's challenges revolve around interior layout of assembly lines or workstations and support for special processing equipment. Crane loads and clearances are often important measurements that influence design. Besides these examples, many other sectors make use of metal buildings, such as agriculture, transportation and retail (think big-box stores). Non-commercial sectors also use them, such as governments, the military and churches. The list is really endless, but the lack of uniformity means that the contractor must approve each project as a special case. Building with steel has other advantages not yet mentioned. For instance, steel is recognized as being green; its finished product contains up to 70% recycled content. Structural and seam coating warranties range from 25 to 50 years. Steel construction affords better risk management and it enjoys an insurance advantage over other materials. The framing also lends itself well to being scaled up in size at a later date to accommodate changing needs. Facility Builders has a long history of building with steel. We have been the prime contractor for many refuse and recycling facilities owned by national corporations. Our excellent reputation means that other general contractors often contract with us to provide steel framing and onsite erection services. We have trained our staff and have acquired the proper equipment and management skills to deliver these structures safely and satisfactorily. Contact the premier steel building general contractor for your next project.